The GreenCast on-line Nozzle Selector will enable turf managers and sprayer operators to select the best combination of spray nozzle and water volume to optimise turf applications this season. The easy-to-use tool, available on the GreenCast website Application Zone, enables operators to quickly select the intended spray target and the type of treatment or product being applied, to instantly see the appropriate XC Nozzle and water volume to use. The Nozzle Selector covers the range of fungicides, herbicides and growth regulators, along with associated liquid fertiliser tank-mix combinations that can be included to improve turf health and vigour to counter disease risks. 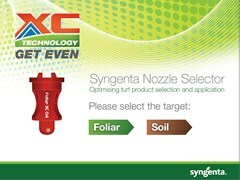 Syngenta Turf Technical Manager, Dr Simon Watson, highlighted the new XC Nozzles can allow operators to apply at lower water volumes than previously used. This can enable greater sprayer output for more timely application, reduce weight carried on greens and, most importantly, increase product retention on the leaf that can give better results. Operators can use the free tool on-line, or download and save an interactive pdf for use at any time. The Nozzle Selector is available in the Application Zone, along with further inormation on the XC Nozzle range. Click here to download the pdf and use the Nozzle Selector.